Early this year, I talked about how much blacks and neutrals I have in my wardrobe and as a challenge for myself this year, I am adding more and more colors into my wardrobe. So I am very picky now with my purchases, thinking beforehand in how much ways I could style it (since I'm not very good with colors...yet). But then, I still have my moments when I walk back to wearing either earth tones or blacks and find ways to liven it up a bit. 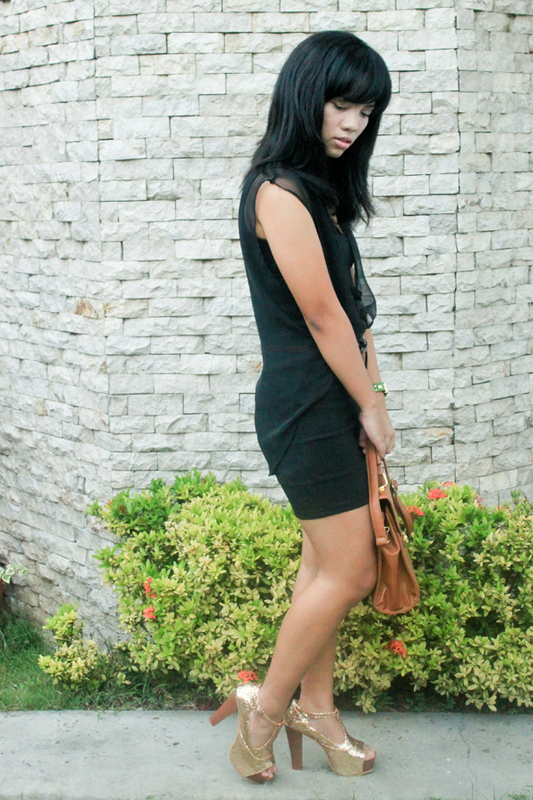 For an all-black ensemble, I guess the usual response would be to add hints of color (hi green watch from Tomato!). But since I was set to party with Calvin Harris this day, I used accents of gold instead to make myself party-ready. Of course, the shoes didn't come out until after work! ;) I wouldn't want to blind my officemates' eyes as I shimmy into the room! Hahaha. It also helps to use pieces made out of different materials in order to add dimension and variations of silhouette into your look. 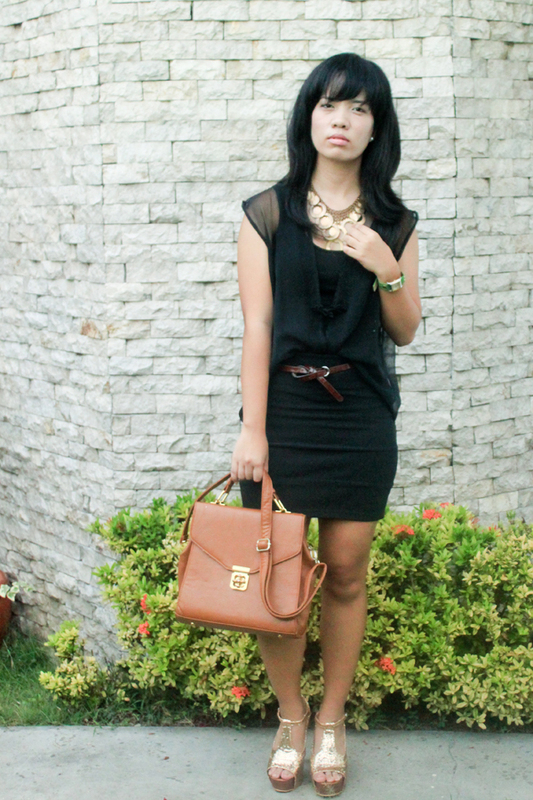 For this, I used a sheer vintage vest, a simple cotton tank top and a bodycon skirt. Don't you just love the JC Foxy inspired shoes? I got them from Sing Styles! This would have to be my first purchase of heels online and well, I followed my "online shopping tips" because I wanted to make sure to make it count. I know Sing Styles' owner, Bianca, personally. I met her during the St. James Bazaar, I think, and I've also been seeing her on the web (she's a blogger!). So I knew I'd be in good hands. Anyway, I still can't believe I was able to attend Calvin Harris Live in Manila. It was so insanely amazing! Everyone was jumping, dancing and singing along with the music he spun. He played my favorites: We Found Love and Feels So Close! :) Were you there too?